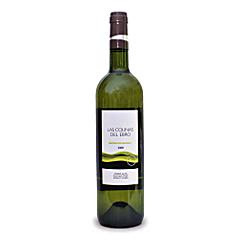 Las Colinas del Ebro is a Grenache Blanc made in the Spanish highlands of Terra Alta in southern Catalunya. It is said to be made from grapes that are hand-harvested from 100 year-old vines, some of the oldest vines in the nation. Stainless steel fermentation promises a crisp and clean taste. The nose certainly smells fresh. There's a good, clean whiff of minerals, but along with that comes a fruity and flowery aroma profile. It's actually sweet smelling - not sugary sweet, but rather like honeyed fruit. The palate shows that fruit well. I imagine honeydew melon mixed with nectarines. A good sense of minerality comes along about halfway through and delivers a very nice tang. I initially felt the acidity could be a bit higher for me, that despite all the good things happening aroma- and taste-wise, the wine fell just a tad flat for lack of a backbone. However, remembering the Argentine chicken and zucchini in the refrigerator, I decided to give it a shot. Rather surprisingly, the wine paired quite well with the dish - as well as with a few stray sauteed mushrooms. It's quite possible that Las Colinas del Ebro could very well have a spot on my deck all summer long - and at my table year-round.